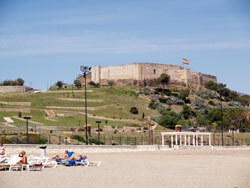 In the Costa del Sol in southern Spain, is situated the city of Malaga. It is the fifth largest city in Spain, with rich natural resources, mountains, valleys, mediterranean forests, rivers and hills, and of course the Mediterranean Sea! Let´s see some of the recommended places to visit so you can start to plan your trips and tours from Malaga with your rental car. Malaga city is situated at the foot of Castle Gibralfaro, a lively and very joyful and bustling city with exceptional corners. Contemporary Malaga is a very modern city. The capital of the Costa del Sol has an international airport (Malaga airport), as well as a large and important commercial port, and a prestigious university.